As we move into the next phase of streaming media world dominance, in which studios launch their very own services with exclusive content in an effort to compete with Netflix (take a bow, Disney Play), Warner Bros. has announced (via a Kevin Smith-hosted live stream) that its DC Universe digital subscription service will launch in the US on September 15, 2018. The platform will provide access to a large back catalogue of animated shows (including Batman: The Animated Series in high definition) and movies, brand new animated and live-action original shows (such as the upcoming Titans and Swamp Thing), a Comixology-style library of digital comics and a forum for fans to discuss their favorite DC properties. 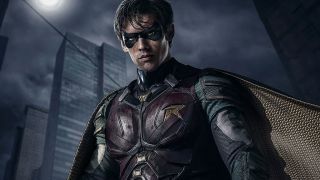 Along with its arrival date, it's also been revealed that DC Universe's first big original series, Titans, will land on the service a little less than a month later on October 12 (those attending New York Comic-Con will get the chance to see it early on October 3). DC Universe has only been announced for the US so far, and has been priced at $7.99 per month (roughly £6 / AU$11) or $74.99 per year (around £60 / AU$100) with an initial three extra months offered free of charge. According to Smith, the subscription price will give users access to two screens at once. Users in the US who sign up for the DC Universe service before 6AM (PST) on September 12 will also be in the running to win a Batman studio tour and a ride in the Batmobile. You can check out the excessively grim and gritty trailer for Titans below, but be warned — it's so edgy that you may cut yourself just watching it.